Looking to make a healthier switch and to add a little yogurt to your recipes? Chobani at www.Chobani.com makes it super easy! I was sure surprised. I had been wanting to make some pies for awhile now but the sugar filled jams and pie fillings always made me think twice. I am not much of a sugar eater, but I do love a nice warm piece of pie with a cup of tea. Today I made my version of a mini lemon pie using some Chobani Greek Lemon Yogurt. What a delicious little pie, small enough to not compromise your diet and full of all the benefits of Greek yogurt! Mix the yogurt with the cornstarch and add a tablespoon of lemon juice from the fresh lemon. Place half the hearts on the tray, add a spoonful of the yogurt, next brush the edges with the egg mix and layer on the top heart, press down the edges only with your fingers to seal, then using a fork press the edges, this helps to seal and makes a lovely decoration around the edge. Brush the tops with the egg mix and bake for about 12-16 minutes, just until browned around the edges. If you desire a little chocolate, melt your chips and drizzle on the top! The inside turns to a nice creamy custard texture, with just enough lemon tartness, not too sweet. These would make perfect little pies for a tea party or just a little after dinner dessert. Chobani has so many flavors of yogurt, you can make any pie you desire! Just head over to www.Chobani.com and see all the great flavors and recipes they have for you! I am thinking of some Chobani chocolate yogurt pies for my chocolate loving husband! Hope you enjoy your little Chobani pies! Etsy is stocked up! Whew! Got a bunch of camera straps made and put in my etsy shop! If you or someone you know owns a DSLR camera (canon rebel, etc) these straps make a fun gift, they make wearing your camera so comfortable, nice and soft and they have lots of personality, I have themes for every person! Headed to a scrapbooking retreat in a couple weeks where I will be taking them with me so if you are interested better get one now before they are gone! 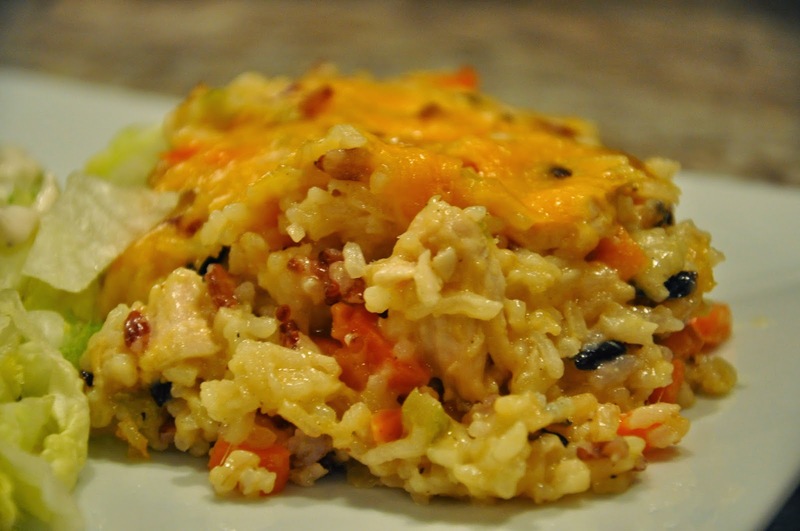 Chicken and wild rice recipe, It's a Keeper! I came across this recipe on pinterest and thought this would be good to try, it has everything my hubby likes and since he is a picky eater and it came from a site called "Picky Palate" well, I figured this should work! It is a little labor intensive, but if you want to shorten the cooking time by using pre-made items, I will give you the fast version too....I can see this coming together in 20 minutes or less! Personally, I prefer the homemade everything method as food just tastes better from scratch, I am lucky enough to be able to leave work early and spend lots of time in the kitchen, yes, I am very lucky! So here we go for a Cheesy Chicken and Wild rice casserole....it was fabulous! I roasted my own whole chicken first, let it cool down, then cut up 2 cups of meat from it. While the chicken cooked I made the rice's. Heat the olive oil in a pan and saute the carrots, celery and onion for about 10 minutes, then add garlic, cook a couple minutes more. Then add chicken, rice's, salt and pepper. Mix well and pour into a casserole dish, 9x13 size. Now the best part, making the cheese sauce, this was so glorious and beautiful, I was shocked I was able to pull this off, I am horrible at gravy and sauces!! This one worked like a charm! Melt the butter in a sauce pan over medium heat, whisk in flour slowly until you get a nice paste forming, add salt and pepper and slowly start to pour in the chicken broth, whisking continuously, once it is smooth and ready to boil, turn the heat off and whisk in cheese, once cheese is melted and the sauce is shiny and silky and gorgeous...pour it on top of the chicken and rice, mix it around, top with some cheddar cheese and bake for 30 minutes, take out and let it sit up about 15 minutes and then serve. Hubby loved, loved it, me too! Use pre-cooked roasted chicken you get at the grocery store deli. Use pre-cooked bagged rice's in the rice section of grocery store, use one wild and one white. For the cheese sauce I would still do the cook your own version, it is so good, but in a pinch, heat up 2 cans of cheddar cheese soup, mixed with 2 cans milk, season with pepper only, as canned soup has too much salt! New Year, New Stuff to Try! So let's start off with some fried chicken, but this is a bit more healthy then traditional fried chicken, plus there is no frying involved! 1 pack chicken thighs with skin or with out, depends on just how healthy you want to go. Bowl of flour, approx. 2 cups mixed with lots of pepper and Accent. The night before put thighs in a casserole dish 12x9, Pepper and Accent them heavily!! Pour on buttermilk, cover and marinate overnight until you are ready to cook the next day. Pick out pieces of chicken and drain the buttermilk, dredge the pieces in flour coating both sides and place on large rimmed baking tray covered in foil and sprayed with non stick spray. Bake 25 minutes, turn over, bake 25 minutes, turn over and broil the tops a few minutes, turn over broil the tops a few minutes. 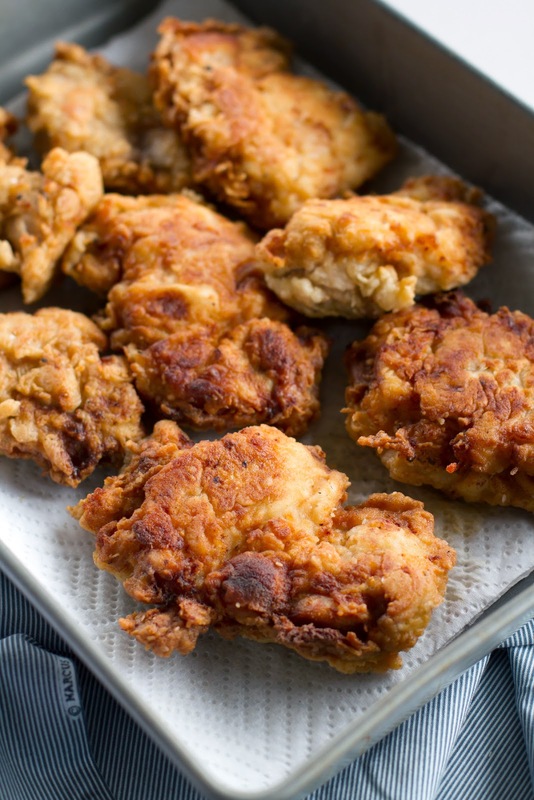 Remove from tray and place on wire rack with paper towels under it, let chicken sit up about 15 minutes and then serve, YUM, tastes like fried chicken without the frying!!! I served with mash potatoes and broccoli, great meal! So I hope you will enjoy my cooking experiences this year and hopefully we will all get about 50 new recipes!! Been busy this first week...Hope to be back in the swing of things soon....I sold 6 camera straps over the holiday so I need to get some made to restock my etsy shop! It has been so cold here, I really want to get to work on my knitting. Let see what else do I want to do this year??? Learn to knit, refinish our pool bottom and get new quiet pump, lose 5 pounds. Hope you get everything done on your new year list!